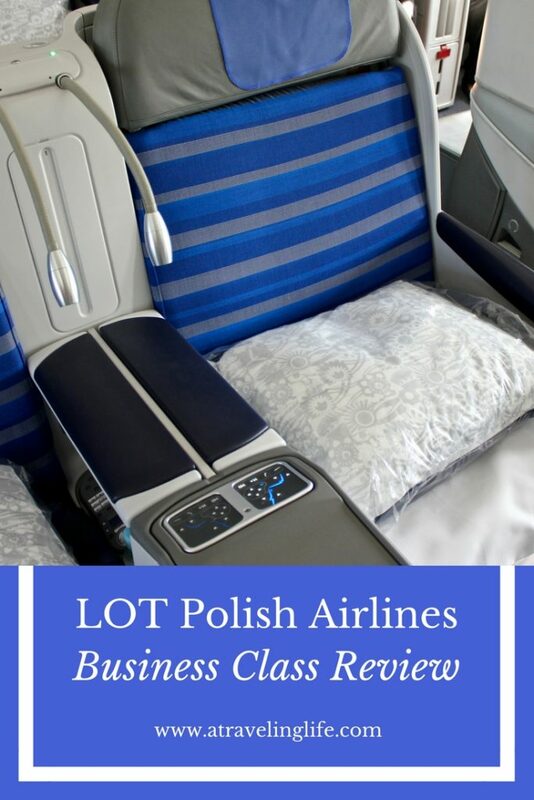 This is what it was like to fly Business Class on LOT Polish Airlines’ inaugural flight from Newark International Airport to Warsaw Chopin Airport on a 787 Dreamliner™. I’m tall. I’m also cheap. 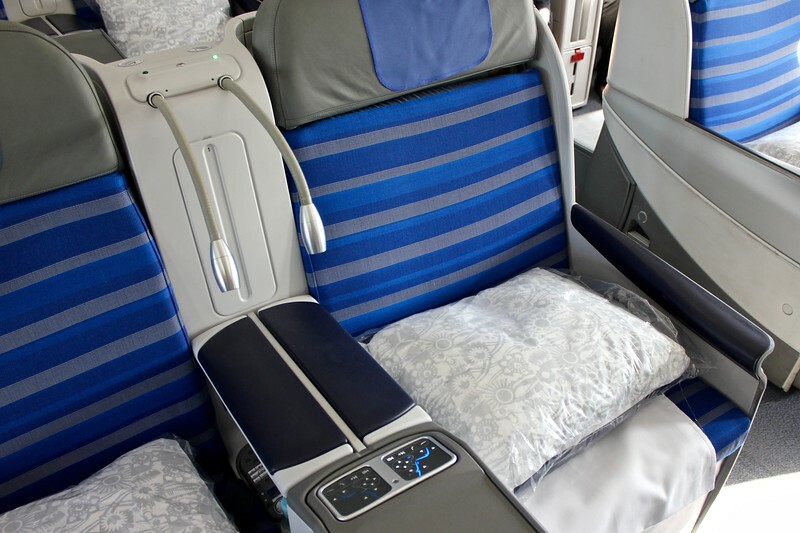 For those two reasons, long-haul flights for me are usually quite unpleasant – being crammed in coach is no fun, especially when I need to get some sleep. So I was absolutely giddy when I learned I’d be flying Business Class for the very first time in my life on my way to Poland for a week-long press trip with Poland Travel. 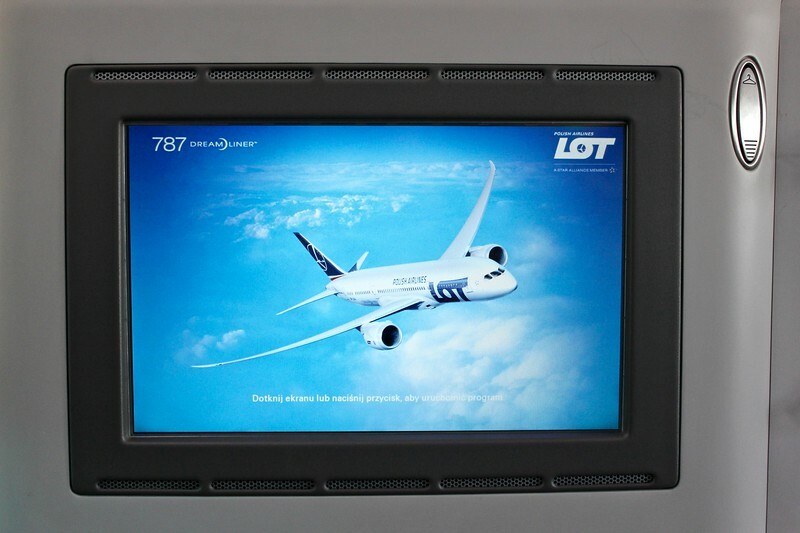 Making the occasion even more special, we were going to guests on LOT Polish Airlines‘ inaugural flight from Newark to Warsaw on its state-of-the-art 787 Dreamliner. This was my roomy, comfortable seat on the Dreamliner (Check out all those controls on the arm rest!). 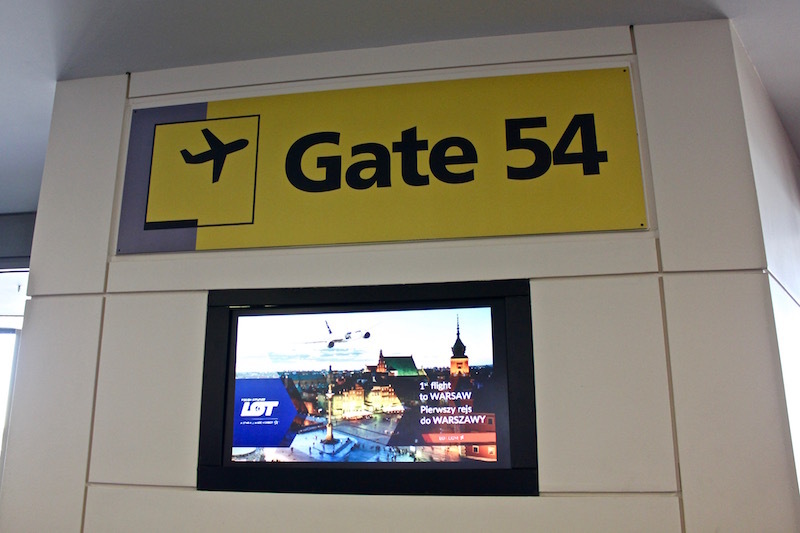 When I arrived at the LOT Polish Airlines gate at Newark, I was delighted to find a party was underway. Pilots, flight attendants, corporate staff, and passengers were all chatting, taking photos, and enjoying complimentary sandwiches and cupcakes. There was also a ribbon cutting ceremony and some brief speeches celebrating this new route – an important one for the Polish community living in the U.S. 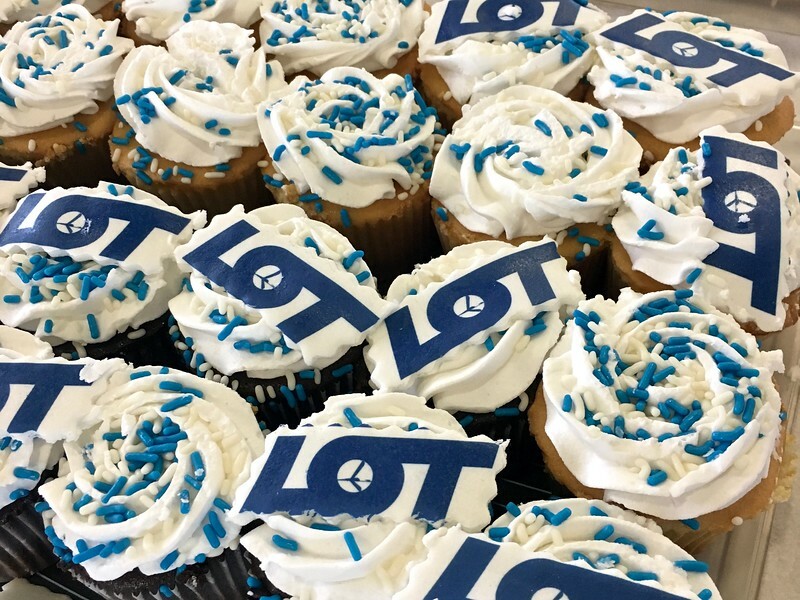 These were the tasty treats served at the pre-flight party. The flight was delayed a bit, which meant we had even more time to socialize before takeoff. 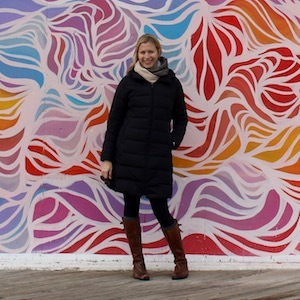 Once we were able to board, I practically skipped on – I was so excited to get the flight and the trip underway. Luckily, I didn’t have to maneuver myself and my bags to the back of the plane like I usually do, since I was sitting in the third row. (“WHAT?! ME? 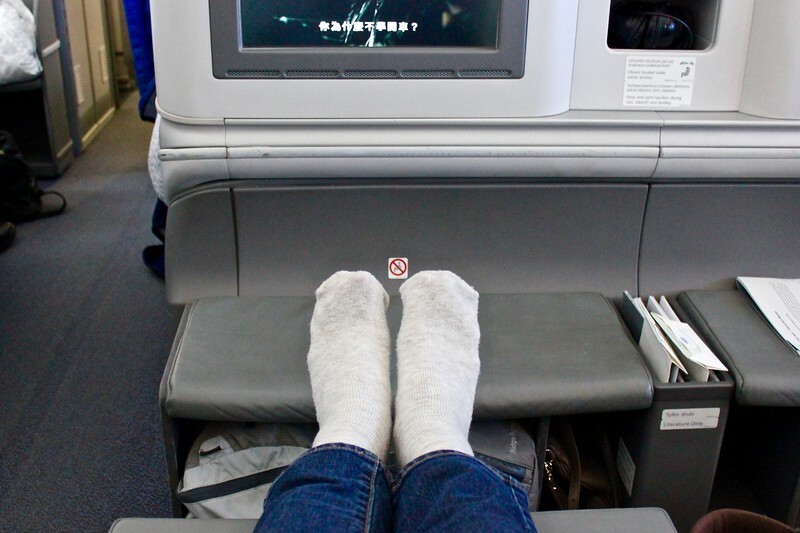 !”) I was also able to extend my long legs straight out on the footrest instead of worrying about the seat in front of me reclining and slamming into my knees. Once in the air, we kicked off the eight-hour flight with a multi-course meal. 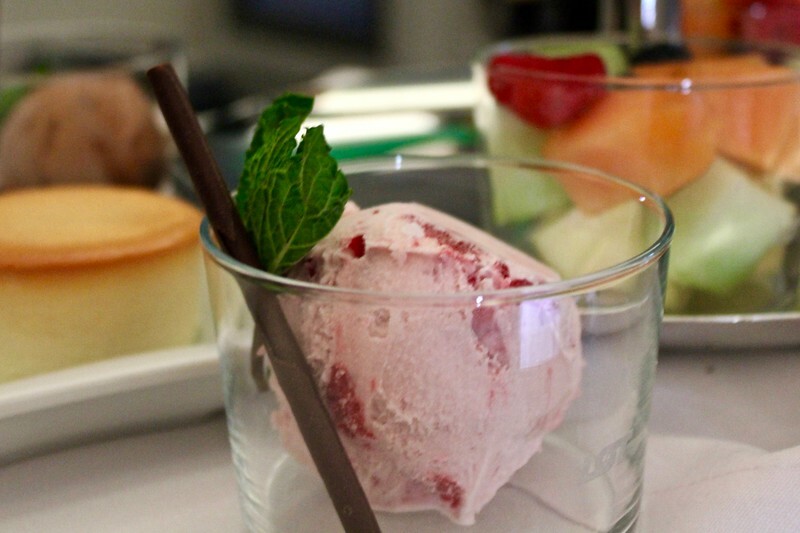 It wasn’t your standard airplane fare, rather, it was a full-on gourmet dining experience on-par with some of the best restaurants I’ve ever eaten at – the service and attention to detail was truly impressive. Even though I had filled up on snacks at the pre-party, I still enjoyed soup and salad, followed by an entree of grilled fish and vegetables, and then strawberry sorbet and chocolates for dessert – all beautifully presented and accompanied by my choice of wine. I wasn’t hungry at this point, but I couldn’t turn down something this beautiful! After dinner, I chose to watch the movie “Marblehead,” a dark film which quickly dulled my mood and lulled me to sleep. So I reclined my seat ALL THE WAY DOWN (Like a bed! Ack!) and got some much-needed sleep. After a few hours passed, we were all up and eating breakfast. My only complaint is that the flight was way too short. I wanted to stay there in my cozy seat, watch movies and drink wine for a few more hours. But, alas, Warsaw was calling us, and we needed to disembark and start exploring the city. 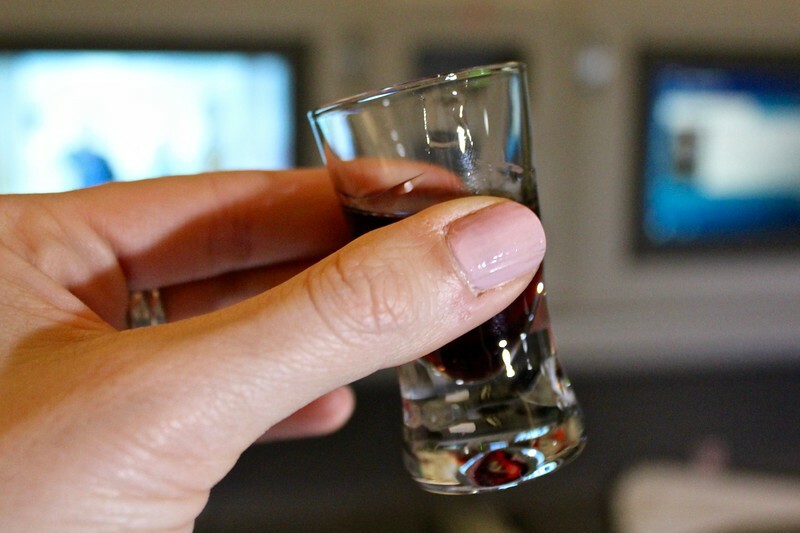 Cheers to LOT Polish Airlines! This was cherry liquor, my first taste of Poland. I don’t know when I’ll be lucky enough to have this experience again. But if you’re planning on traveling to Poland – or any of the other 70+ destinations served by LOT – I highly recommend you hop on the Dreamliner. And spring for Business Class if you can. Trust me, it’s worth it! My long legs were so happy! It has a lighter design, so it consumes less fuel and has a longer range. It has a lower cabin pressure, minimizing altitude sickness, dizziness and nausea. It offers passengers 8 percent more oxygen, higher humidity and better air filtration to reduce the feeling of tiredness. Its wings have elevated tips to reduce air resistance, which results in a smoother ride. Its windows are 30 percent larger. Its cabins feature special LED lighting, and the intensity and color can be changed to reduce the effects of time zone changes. Thank you to Poland Travel for organizing this once-in-a-lifetime trip for me, providing transportation on LOT Polish Airlines, and hosting me throughout my stay in Warsaw and Krakow. All opinions are my own.